and fabulous food. Grant loves to cook and he is an organic nut. I found something to make that he actually ranted about. version of this recipe did change a bit. See below for the changes. Here is Whole Foods recipe. Cooking dried beans is low maintenance and a great value. Make sure to plan ahead and allow time for soaking the beans. Serve with hot sauce or salsa, if you like. In a large pot, bring 1/2 cup water to a simmer over medium-high heat. Add onions, bell pepper and garlic and cook, stirring frequently, until onions are translucent and beginning to brown, about 10 minutes. Stir in cumin and chipotle and cook 1 minute, stirring. Add drained beans and 10 cups water. 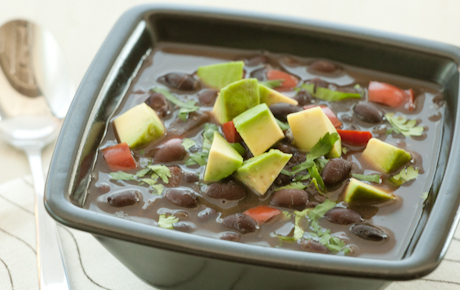 Bring soup to a boil, then lower to a simmer and cook, uncovered, for 1 1/2 to 2 hours, until beans are tender. Remove 4 cups soup and carefully purée in a blender. Return purée to pot and stir in cilantro, nutritional yeast and lime juice. Spoon into bowls for serving and garnish with avocado. I asked for black beans not even thinking about the dried version or the canned version. I got canned black beans (organic) so I skipped the soaking. Followed the recipe, omitting the yeast and threw it all in the crock pot to warm. I tried the puree step also but it didnt work for me, so this was a cross between a soup and an a salsa. Delicious and good for you. The leftovers were great with my eggs this morning also. Man, I am going to miss them when they move. Thank goodness their home will be close to my work. Maybe I can swing by on my way home and they can leave a doggy bag on the front porch. mmmmmm… this recipe sounds really good. I like making chili or black bean soup or tortilla soup, all mostly the same ingredients. I haven't tried the ground chipotle pepper. Great idea! Looks delicious, can't wait to try it. Question….what is the nutritional yeast used for, and can it be omitted? I assumed the yeast was used as a thickening agent. Since I didnt "mash" up a bunch of the beans. Since I didnt do that part I also left out the yeast.